A stewardess brings a meal to her colleague aboard the lunar shuttle in Stanley Kubrick's "2001: A Space Odyssey." Mackenzie Thompson manages marketing and mission fulfillment initiatives with the Disque Foundation and the Save a Life Initiative, which help communities learn life-saving techniques like CPR — a valuable skill to have both on Earth and in space. Thompson contributed this article to Space.com's Expert Voices: Op-Ed & Insights. As is often the case with private companies' ambitious plans to launch tourists into space, the timelines for these missions often change. While the time has not yet come for private citizens to start booking tickets for out-of-this-world adventures, now is the right time to start thinking about the comfort and safety of the tourists that will soon start blasting off into space. Flight attendants are professionals whose expertise is essential to in-flight safety. Without their help, passengers could jeopardize their health and risk their lives by flying the not-so-friendly skies. For example, passengers would not necessarily know where to find or how to use safety equipment like oxygen masks and flotation devices in case of an emergency. With the guidance of a well-trained spaceflight attendant, passengers can put themselves at ease and enjoy their flights, taking in the incredible views of Earth from space without having to worry too much about their own safety and comfort.. Excellent flight crews make both spaceflight and ordinary airplane flights possible both before and after a spacecraft or an airplane leaves the ground. For example, the Delta Air Lines Flight Attendant Training Center has a 1 percent acceptance rate for new flight attendants. In six weeks, students learn federal aviation regulations, how to defend themselves and others against unruly passengers and hijackers, how to evacuate on water and land, how to handle medical emergencies, and how to use all the equipment at their disposal to assist passengers during a flight. They also learn how to perform cardiopulmonary resuscitation (CPR) — a crucial life-saving technique that my organization, the Disque Foundation, teaches to people around the world. Debris from Virgin Galactic's SpaceShipTwo is seen on the Mojave Desert floor after a tragic crash during a test flight on Oct. 31, 2014. One pilot was killed and another injured during the crash. Now, look at the above image of Virgin Galactic's SpaceShipTwo, a spacecraft built for space tourism that crashed in the Mojave Desert during a test flight in 2014. I offer the photo not as criticism but as a cautionary tale about the dangers of attempting to escape Earth's atmosphere, never mind achieving and maintaining the escape velocity necessary to reach suborbital space. Look, also, at the video mock-up below of Blue Origin's New Shepard space capsule. It looks spacious (pun intended) compared with the Apollo 11 Lunar Module, but it is far from spacious. When room is so scarce, and fuel is so precious, there is little or no room for additional weight. 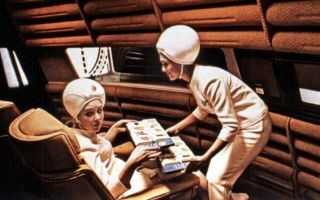 What, then, will be the role of flight attendants in this new era of transportation and space exploration? Will there be room enough for them to assume their role as vital workers? Where, for that matter, is the school that will teach this elite corps of astronaut flight attendants? Will NASA and the FAA start or subsidize this academy? Will spaceflight attendants go through the same kind of training as NASA's astronauts? And will there be enough trained flight attendants to meet the demands of pilots and passengers once the space tourism industry finally takes flight? Before civilians can start booking spaceflights, we should confirm the availability of flight attendants — and make sure there's room for them aboard the spacecraft — to bring additional safety and security to flights that are more treacherous than we may choose to believe. Before we put our lives on the line, we should at least make sure there are men and women who will join us, not for their happiness but our own. We need flight attendants, now more than ever.